In the last couple of weeks I've been obsessively geeking out over customizing my Android home screen. Not sure what triggered it. Google+ Android communities helped me out, and I got fancy with the next attempt. This was pretty much my weekend last weekend, but I learned a lot and had a blast. A real designer originally created this design, and I just cribbed it (he provided all the moving parts and gave me permission to have at it.) I took his very manly, black and tan layout with a tough Gorillaz-looking avatar image, and turned it DarkEmeralds Type 4. 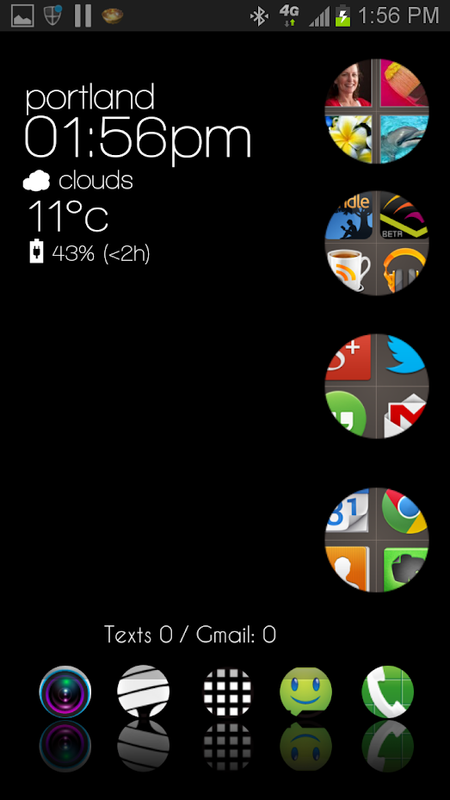 The dotted line around the clock is a battery widget. Tapping on the date launches my calendar. Tapping on the weather icon launches the weather report. The little black circle in front of my eyes there launches the camera. Contacts come up when I tap on my face. Google Now is hidden in the clock face along with the moon. Today, for the winter solstice, I made this one. It only took about half as long as the magenta one, and I'm starting to see the whole world in terms of phone screens. I don't know where this is going to end. Oooh, that last one is AMAZING. Thank you! I'm enjoying it. I saw an example somewhere, where someone had taken a lovely photograph of an old map with a sextant and a spyglass on it--all sepia and adventurous-looking, and had inserted text-based widgets that looked just like they belonged on the map. I was inspired! It's one of those things...the patience, the stillness, the obsessive perfectionism that half the time drive me and others nuts find a perfect outlet at this crossroads of programming and graphic design. I loved this crow print the moment I saw it.